In answer to Chicagoan in Montreal‘s photo of Montreal from above (which I’ve been using as a desktop for some time, and get compliments on all the time), here’s my aerial photo of the Kennebecasis Valley. Click for a large (1.1 MB) version. I took this photograph this past Sunday, from the window of a little Dash-8 propeller plane on its way from Saint John, New Brunswick to Montreal, Quebec. It covers almost all of Rothesay (my home) and Quispamsis from the Foster Thurston road to Darlings Island. I might even dare to say that Hampton is out there at the very back. 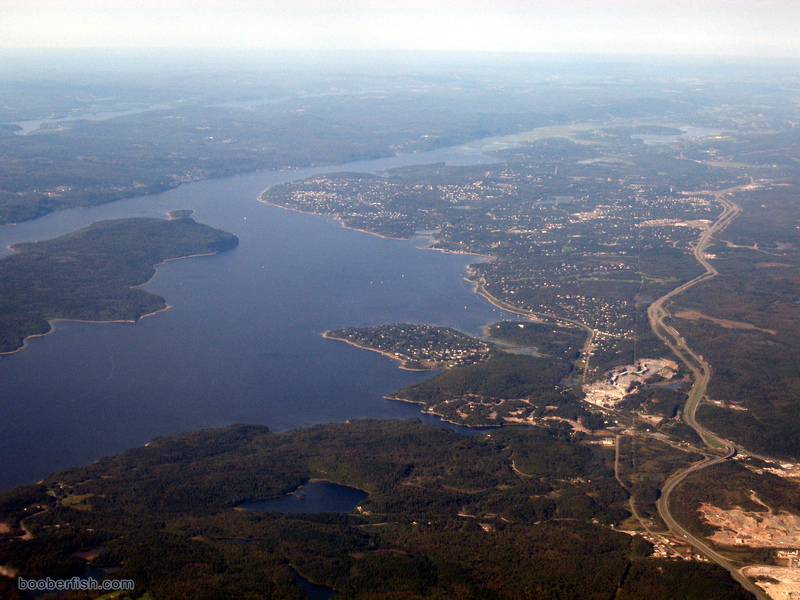 You can see the Kingston Penninsula between the Kennebecasis River and the Saint John River in the distance. Much closer, on the left side of the photo, is most of Long Island. As you can tell, the population there is much, much less than that of the New York island of the same name. I think while I’m in Montreal, this photo of the Kennebecasis River Valley will be my new desktop photo, but when I go back to Rothesay I’ll switch back to Chicagoan’s photo of Montreal. It’s sad, but home is always where I’m not. Glad you like the photo. It is one of my most popular on Flickr. It is interesting because the original was very hazy. After a little work in Photoshop, it became much nicer. Thanks again for the shout out. It’s cool that your shot has a similar angle up a river.